At first glance, this collage appears to be a simple study— a convergence, or construction, of differently colored shapes floating in a seemingly infinite space. 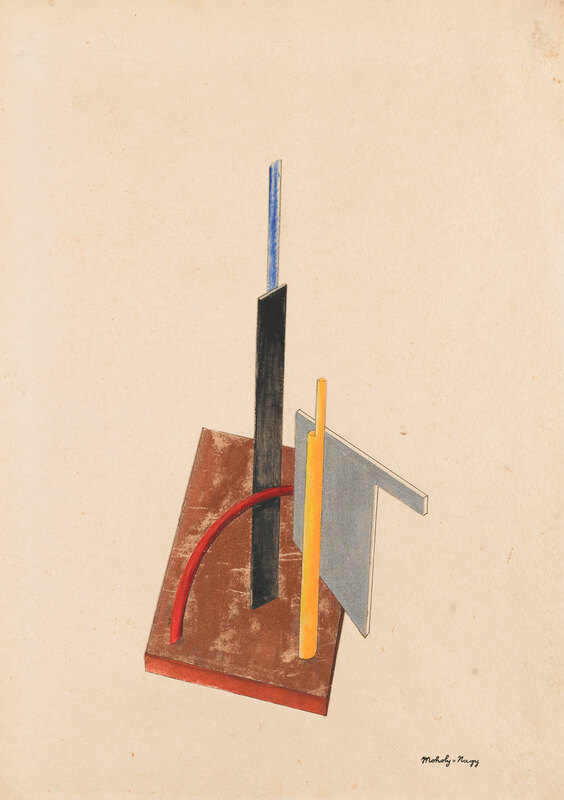 A closer look, however, reveals that the work encompasses many of Hungarian-born avant-gardist László Moholy-Nagy’s beliefs about the role of art in the modern era. Moholy-Nagy established himself as an artist in Berlin in the aftermath of World War I and spent much of the 1920s teaching at Germany’s famous school of art and design, the Bauhaus. Finding inspiration in the newly industrialized city, he saw potential for employing modern production processes for the creation of art. He found that the city dweller was confronted with an array of new visual and aural stimuli—cars, buses, factories and crowds of people—as well as previously unheard of perspectives. One could now look down on the city from a skyscraper and look up a those tall buildings from a speeding car. For someone who had grown up in the quiet countryside these new experiences could be overwhelming. The artist concluded that artwork of the period should confront the urban condition and set out to find new, appropriate modes of artistic production. Along this live of thought, Moholy-Nagy famously ordered paintings from a German sign factory in 1923 and, with the help of a mechanic and architect, produced a kinetic light sculpture in 1930. However, despite his embrace of new technology, painting remained for Moholy-Nagy the ultimate space within which to experiment. The metallic sheen of the copper and silver forms in Abstraction suggests newly invented industrial paints. The tall rectangles recall the shapes of recently constructed skyscrapers and the perspective suggests an aerial view. What better way for the modern urbanite to relate to the new spatial relationships of the city than to have those relationships abstracted on a small scale? If nothing else, a small French customs stamp on the back of the work reveals that the piece retained significance for Moholy-Nagy, as it followed him from Germany to France and then the United States, where he eventually settled. László Moholy-Nagy, “Abstract of an Artist,” The New Vision and Abstract of an Artist (New York: George Wittenborn, Inc., 1947), 72. László Moholy-Nagy, Painting, Photography, Film, (Cambridge, Mass: M.I.T. Press, 1969), 43. Joyce Tsai makes this argument in “Technology’s Surrogate: On the Late Paintings of László Moholy-Nagy.” László Moholy-Nagy: Retrospective, ed. Max Hollein and Ingrid Pfeiffer (Munich: Prestel Verlag, 2009): 136-167.